DUKE Energy awarded $51,395 to 14 schools! Since 2006 Duke Energy has invested over $545,000 in Polk’s teachers and students. Polk Education Foundation (PEF) received $50,000 in funding from Duke Energy for school grants to enhance STEM initiatives for the 2018-2019 school year. Each school awarded received funding up to $5,000. Thank you Jerry Miller and DUKE Energy! Polk Education Foundation awarded over $29,000 in School Matching Grants to 10 schools! 2018-2019 School Matching Grant funding received through the Consortium of Florida Education Foundations as part of the School District Education Foundation Matching Grant Program, is open to all public and charter schools in Polk County and requires schools to solicit and acquire new funds from a private or community donor with the promise of a dollar for dollar match up to $3,000 per school. What a great way to connect and engage community members with local schools. 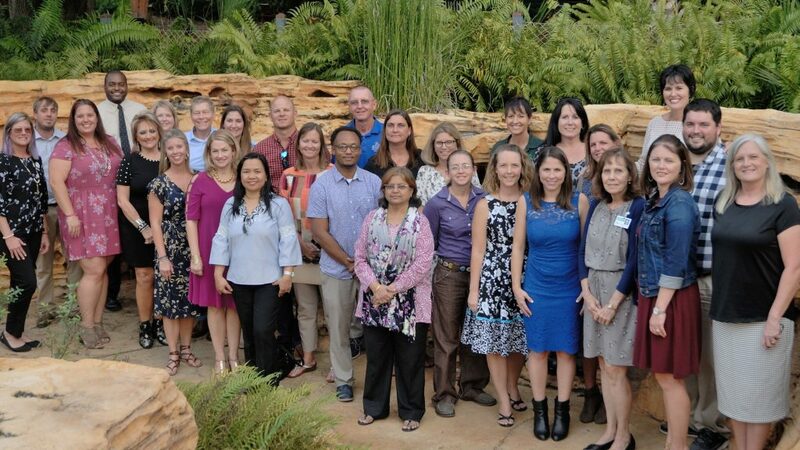 Polk Education Foundation awarded $30,000 in School Matching Grants to 12 schools! STEAMing Up Polk Schools! funded through the Consortium of Florida Education Foundation, awarded $30,000 for STEaM education grants. Grant funds must be used to increase student achievement in STEaM content areas, improve/increase availability and inventory of resources to enhance instruction in STEaM education, and/or fund professional development in alignment with STEaM education initiatives. 2017-2018 AT&T STEM at Work Grant funded two $2,000 STEM (Science-Technology – Engineering- Math) grants through the Consortium of Florida Education Foundations (CFEF). The intention of AT&T is to provide students with opportunities to better understand an area of STEM through workplace-based experiences and to increase their awareness and interest in STEM careers. Chain of Lakes Elementary expanded their project “Amphibians, Reptiles and Birds, Oh My!”. There goal was to transform 2nd grade students into wildlife biologists who marvel at the wonders of the natural world, look closely at the habitat around them and work to protect the natural environment. Great teachers know that it’s not what you teach, it’s how you teach it — and so we used each topic as a springboard into developing higher-order thinking skills, challenging paradigms, and encouraging students to think outside the box. These experiences were completed under the leadership of our business partner Kleinfelder with the underlying purpose of identifying animal and plant species and learning what steps second graders can take to be positive agents of change for our environment both on school campus and in their communities. Combee Academy’s grant provided students with a real world problem that would require them to think collaboratively, problem solve, apply STEM skills, and gain experience working with a business professional. Based on a study by a group of urban and landscape planners, it was noted that “most studies reveal that the distribution of greenspace often disproportionately benefits predominantly white and more affluent communities.” Students researched parks and greenspaces located in the local community and then designed and built a greenspace on campus that is being utilized by our school and community. Students did an excellent job! Although this was challenging for students, they persevered and were proud of their all they accomplished. Both programs will run through the end of April 2018, thanks to the 2017-2018 AT&T STEM at Work grant. With STEM/STEAM (Science-Technology – Engineering- Arts – Math) as a current focus in education, Motorola Solutions Foundation through the Consortium of Florida Education Foundations (CFEF) funded $5,000 for STEM focused business partnership in 2012-2013, 2013-2014, 2014-2015, 2017-2018, and again in 2018-2019. 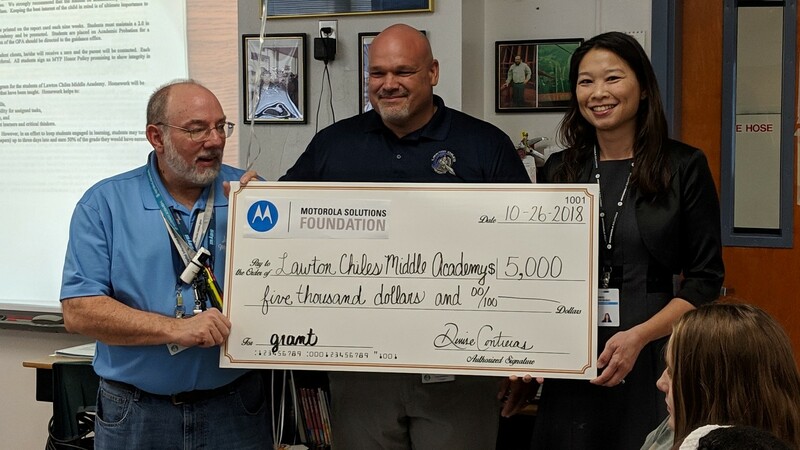 George Bartuska at Lawton Chiles Middle Academy is the 2018-2019 grant recipient. In​ ​response to local STEM needs and opportunities, a​ ​project-based​ ​learning​ ​environment​ ​”High Altitude Ballooning with Global Positioning Satellites”​ was created for students. In this unit students ​are exposed to careers that are in high demand and are involved in high interest Atmospheric Research and Space related topics. Students will construct a thermally insulated spacecraft with the objective of protecting the instrumentation camera, electronics, and battery from the extreme cold temperatures that will be encountered during the flight. Also, students will conduct a complete check-out of the equipment to assure all the electronics are functioning properly, and that the Global Positioning Satellite System is fully operational before launch. A chase team will be established to track and recover the spacecraft as it parachutes back to Earth after the balloon bursts at altitude. This​ ​project will use​ ​the​ ​S.T.E.M.​ ​platform​ ​and​ ​process for​ ​understanding​ ​the​ ​S.T.E.M.​ ​workforce​ ​in​ ​the​ ​community.​ Congratulations! Suncoast Credit Union grants are available to Polk County Public and Charter Schools and Due November 30th. Suncoast Credit Union is proud to invest in education in Polk County. This grant will award one $5,000 grant for ANY need at the selected school. Limit one application per school. Mulberry High School’s teacher Todd Thuma was the recipient of the $5,000 Suncoast Credit Union Grant. Mr. Thuma is in year two of establishing an Engineering program for the high school students. This funding allowed him to purchase some specialized equipment and trainer for students to gain some hands-on experience. Thank you Suncoast Credit Union Foundation! Chain of Lakes Elementary was the recipient of the $5,000 EPCAR grant. The goal of the project was to transform 2nd grade students into wildlife biologists who marvel at the wonders of the natural world, look closely at the habitat around them and work to protect the natural environment. They achieved this goal through hands-on interactive science experiences focused on a different environmental science topic: insects, water quality, owl pellets, amphibians, mammals, birds, trees, and friction. Thank you EPCAR for this great opportunity! The CORE Wealth grants went to Bethune Academy and Babson Park Elementary to teach financial literacy skills. Bethune expanded their “Scallywag” book cart business to include 3 – 5 grade students. Students worked on inventory tracking, counting money, profits and loss, and other financial literacy skills. Babson Park students used OSMO Genius Kits to simulate running a business. Thank You CORE Wealth Advisors for this opportunity! The Professional Educators Network (PEN) of Florida Foundation’s Classroom Makeover Grant program is designed to connect Polk’s K-12 public and charter school teachers with the literacy resources necessary to create the best learning environments possible. What does your ideal Literacy Center look like? Since the needs of teachers and students go far beyond what this grant program could fund, a competitive application process will be used to ensure that the grants are directed to the best possible recipient(s). The strongest applications will have a combination of clarity, organization, and innovation.